Kui is a six year old African Spurred Tortoise that now lives in Kahaluu Oahu. About 3 years ago I was watching Kui in the back yard and a thought came to mind that it would be a great idea to write a children's book about Kui. This started out as just something to do, but in time the story grew and now Kui's book has been published. 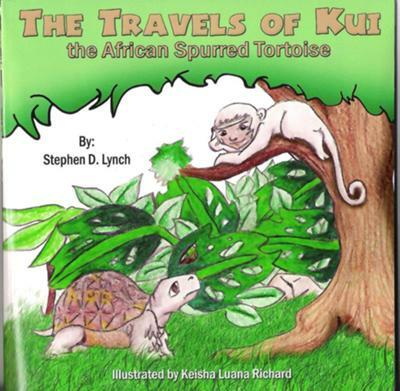 The book is titled The Travels of Kui the African Spurred Tortoise. This book is inspired by Kui and Kui gets all the credit. The story is about Kui being born but he in the last tortoise of his egg shell. Kui finds himself all alone and hungry. When Kui goes off in search of his family and food, Kui's adventures begins. Kui encounters great friendship, and help from his new-found friends gives Kui the strength and encouragement to continue his adventure. This book is to express the importance of family, friendship, and helping others. I hope this book will be an ongoing series as Kui travels the world introducing children of the different places in the world. Kui has hopes his book will suggest that no matter who or where you are from we are all very much alike. Yay for your book! Kui, I'm sure you will be telling Stephen many tortoise stories. And, Stephen, I hope you will write them all down so other people can know them. Thanks for letting me and my friends stop and play today with Kui! it was nice to meet you Steve!!! We took a wrong turn trying to ascape the traffic and we found you walking Kui and stopped to take a picture. That made our day! We will have to get your book. Your book is great it has made its way all the way to Texas it is a really good story great for all ages cant wait for the next book. My youngest son received and read the original script first and i left it up to him to imagine what, where, and how Kui looked like, met, and traveled to during Kui's journey. My son was more amazed after reading the actual published book that had pictures. He really enjoyed the wonderful colorful artistic pictures and was able to compare his imagination thoughts to the book that he brought it to school to share with his class. I recommend this book to all readers from birth to infinity. Its worth it. Your book is fantastic. I bought 2 books for my grand kids. Hi, Kui your book is very good my son reads it daily.. cant wait to hear more stories.. love you!